There are scores of producers and mixers in the music industry today. However, how often would you say you have come across a one that thinks outside the box? Well, enter Greg Townley, a producer and mixer in the music sector of entertainment. You can find his interview with TMV below. TMV: What vibe do you feel when in the process of producing and mixing recordings? Townley: I have always said “I don’t care what I work on, I care who I work with.” I prefer to work in sessions with an atmosphere of respect that allow for creative input. I now find myself in a position where I get to work with artists and composers that all have a great vibe. When a composer and I first start conceptualizing the recording of a release, we set the foundation for the entire record. These ideas can make the rest of the process a very musical one however, in rare circumstances it can be a bit of a struggle. A few examples might be when I am asked, “Where should we record?” Or “Should we record the whole orchestra together or separately?” I have the unique benefit of having had recorded most, if not all of the world’s most viable recording orchestras. That firsthand knowledge of their strengths combined with the choice of hall can greatly affect the outcome of a project. A misstep in those beginning stages can wreak havoc on the production and inevitably, the outcome of a mix. I offer my personal experience to composers to try and guide them through the never-ending options of how to produce trailer music. TMV: Millennium will be the first release by Audiomachine here in 2013. The title track that was unveiled by them was outstanding to say the least. What was the most enjoyable aspect of this particular release? Townley: The most enjoyable part was getting Kevin Rix’s texts after I sent him my first version of a mix. Any time a client is happy with the job, or they achieved more than they expected, well, I’m happy… But in all seriousness, my process involves a lot of solitary isolation. You just have to go into your own space to create and design a sonic landscape that makes a piece become bigger than life. My most enjoyable aspect of this release was that one moment that I knew I had solved the ‘Power Center” puzzles…“Yes! -There it is, I found it!” The whole track suddenly seems to make sense. The power is there, the dimension is there, the emotion is there. With Millennium, this happened every day in the mix room, partly because of Audiomachine’s overall awesomeness but mainly because of Kevin’s writing and the high quality production in choosing the orchestra and venue (The Sydney Philharmonic at Trackdown Scoring Stage). TMV: What exciting new developments can you tell TMV about? Townley: I have been in the studio the past few weeks producing the mix of Immediate Music’s first release of 2013. I went to London to record the best hand-picked musicians from the London Philharmonic and The London Symphony at Abbey Road Studios. Wow! What a room! What a band! I’m just about done, this release should be out in a month or so. 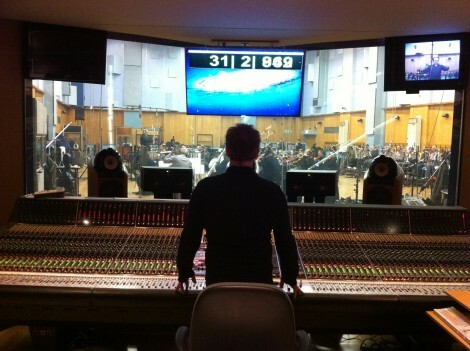 It will be called “Themes for Orchestra and Choir 4- Abbey Road 2”. This is an incredible record, I am proud of my work on it and confident it will be fantastically successful in the industry. TMV: What are your thoughts on the progress of trailer music as a music genre as well as its future? Townley: The success of public release trailer music these days speaks for itself. I’ve seen a real interest and respect grow in the field of trailer music in the past few years. It’s an exciting time because the companies I am working for are really upping their game. I produced or mixed seven full blown releases last year. Massive orchestral, to electronica, to dubstep, metal and beyond. These records I am working on are setting the trend in the industry and elevating the standard for this genre. With each new record I find myself saying ”We are going to push the envelope even further this time.” And each time the music and the production seem to be getting better and better, at least from my little corner of the world. TMV: Do you have any closing comments? Townley: Only that when I am finished mixing or producing a trailer piece from a composer, I find that I have a personal attachment to it. I have to be proud and excited about it. In many ways it doesn’t really matter if a release from a company is a huge orchestral production or mainly sampled based. I give 110% each and every day. It’s essential that my clients know my integrity is as important as my creativity. I truly believe that if the companies I work for are successful, my company is successful. People who write music for a living put their heart and soul into their art, they labor over each and every harmony, craft each and every melody. It takes them days,weeks, sometimes months to realize a piece and maximize its potential. After all that extraordinary hard work and creativity, they then trust me to realize their vision by caring about their music as much as they do. It is adding my own creative artistry in conjunction with the composer’s talent that makes me excited about going into the studio every day to witness a piece of music become what it wanted to become all along. TrailerMusicVibe wants to extend many thanks to Greg Townley for his willing partcipation in this interview.